[ERROR] No compiler is provided in this environment. Perhaps you are running on a JRE    rather than a JDK? 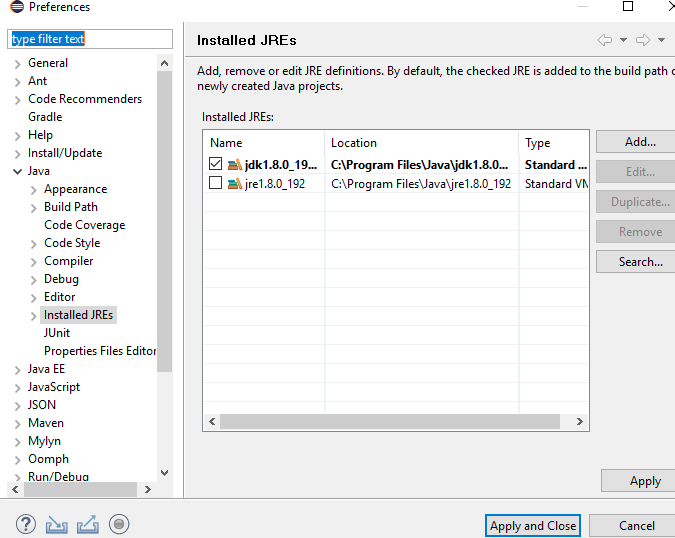 On your Eclipse IDE, go into Window > Preferences > Java > Installed JREs > and check your installed JREs. You should have an entry with a JDK there. In the end I never got m2e to execute in a JDK, but setting the Java compiler explicitly (as above) did the trick. 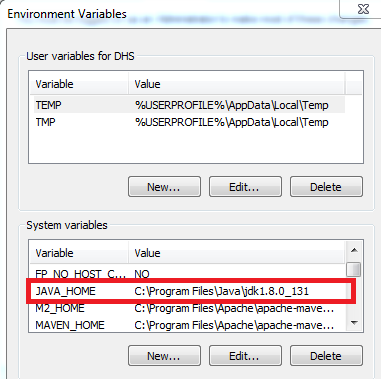 Set the JAVA_HOME environment variable to the JDK root folder - required if you run command line or maven (mvn). I was getting this error when trying to do a maven build from within eclipse. 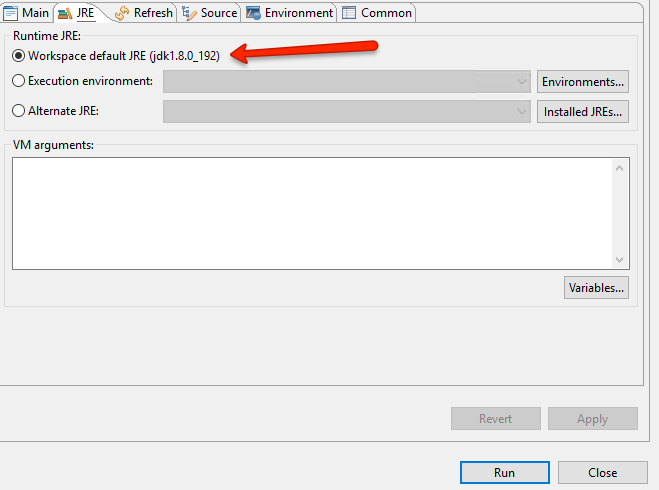 Go to your 'Runtime Configuration' and configure your JRE to an JDK. I tried all of the above, however, still getting the same error message. 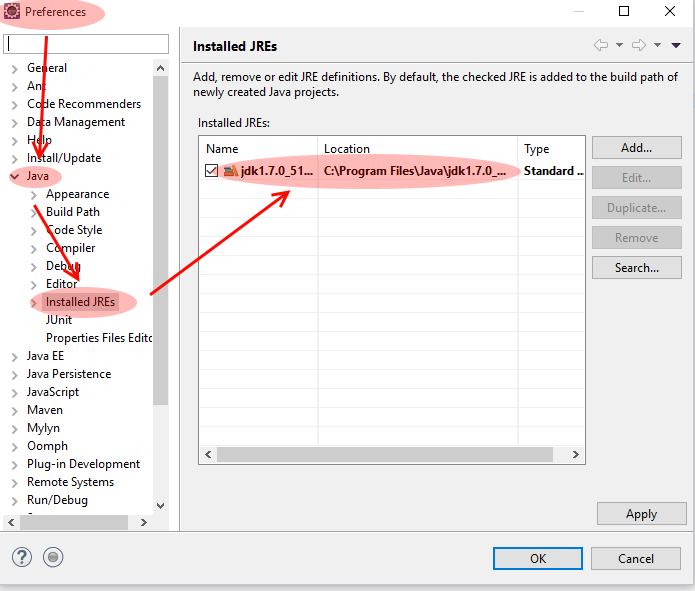 In my case an actual JRE was incorrectly used as JRE System Library in the project-specific build path which was obviously overriding all those other settings discussed here. 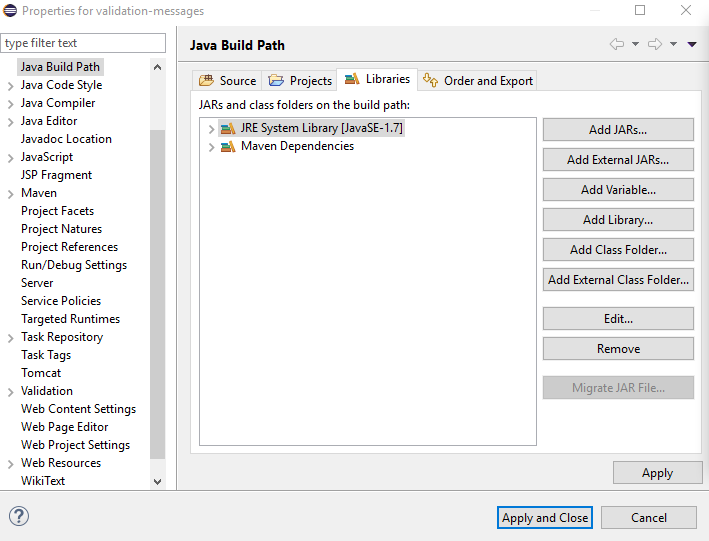 Open the project-specific libraries of the Java Build Path: Right-click "Project > Build Path > Configure Build Path..." and select "Libraries" tab. Select the "JRE System Library" entry and hit "Remove". A wizard pops up. 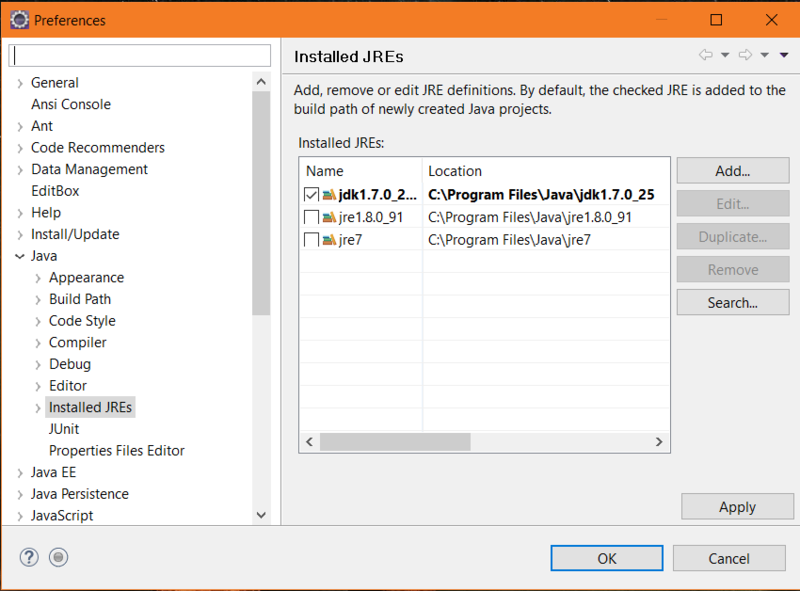 Select "JRE System Library" and hit "Next >". 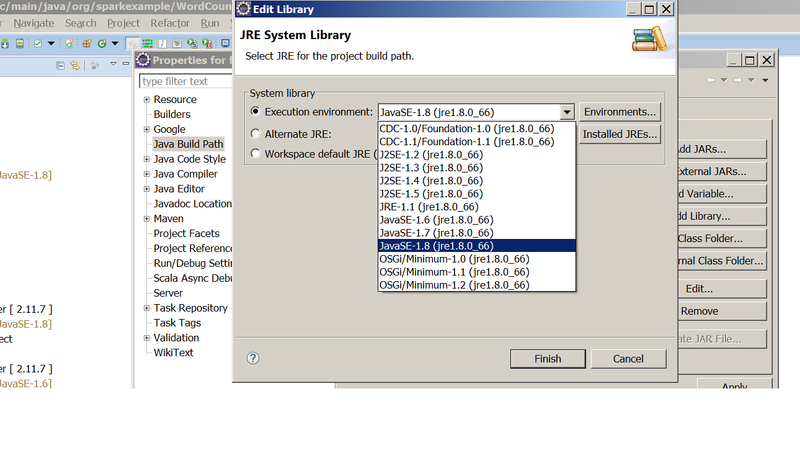 Now select the correct JDK (in my case "Workspace default JRE", which I configured using a JDK). Close wizard by hitting "Finish". Close "Properties" dialog by hitting "OK". I got same issue and i just add JAVA_HOME to environment variables. If you are using intellij, just after adding JAVA_HOME open command prompt from project directory and run mvn clean install(don't use intellij terminal). 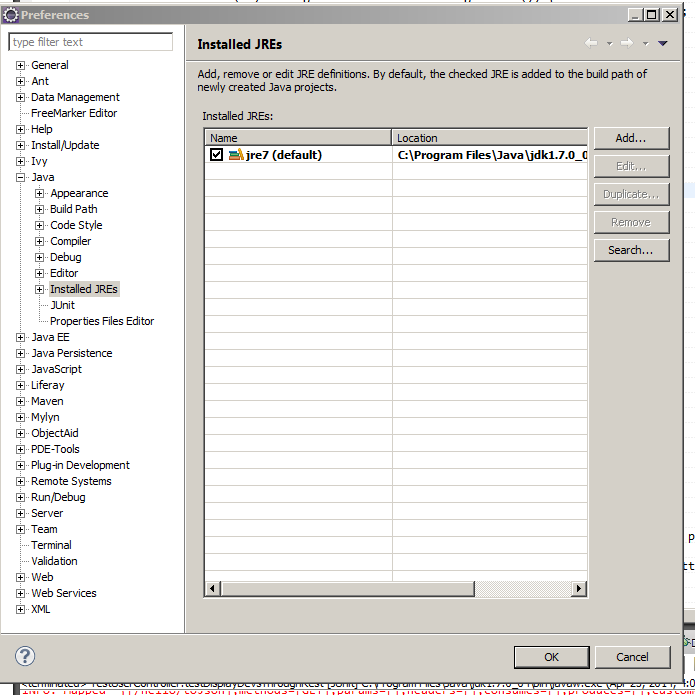 start cmd.exe /k "cd c:\aem_proj\sis\aau"
I faced the same issue while trying to build a jar file of my project application using mvn clean install, though the application was working fine while running from Eclipse. The issue was, indeed too naive, that I had not set the JAVA_HOME environment variable. All I had to do is set JAVA_HOME environment variable to JDK directory, make sure it is not till "\bin" and without semi-colon ";". 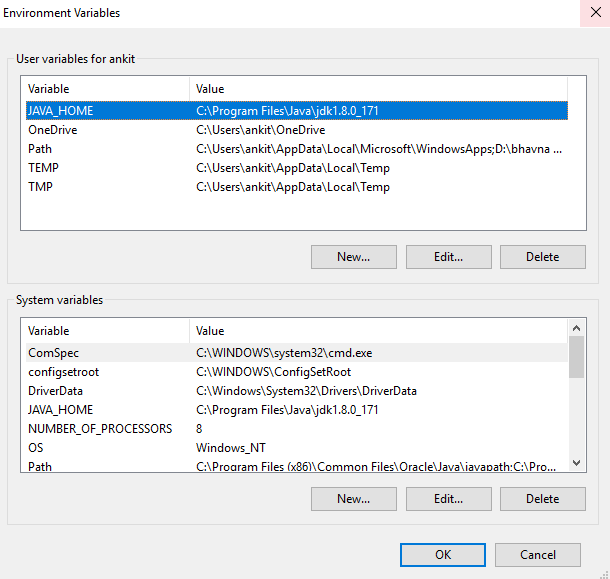 This configuration does not apply to maven command that we run on command prompt. 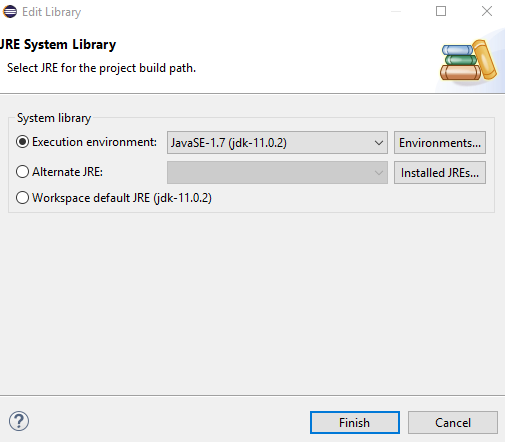 It will still look for JAVA_HOME variable to access the JRE System library and when it is not found it refers to external JRE folder without JDK. There are several options to specify. Steps: Right on project in project explorer Go to Run-> Run Configuration -> Click Maven Build -> Click on your build config/or create a new config. You will see the window as the given snapshot below, click on JRE tab there. So I removed 1. Probably swapping them would fix it too. There is another possible answer to this question, and I may be the only person foolish enough to have stumbled upon this, but I think it's worth adding, since none of the other answers applied as I already had those settings correct. 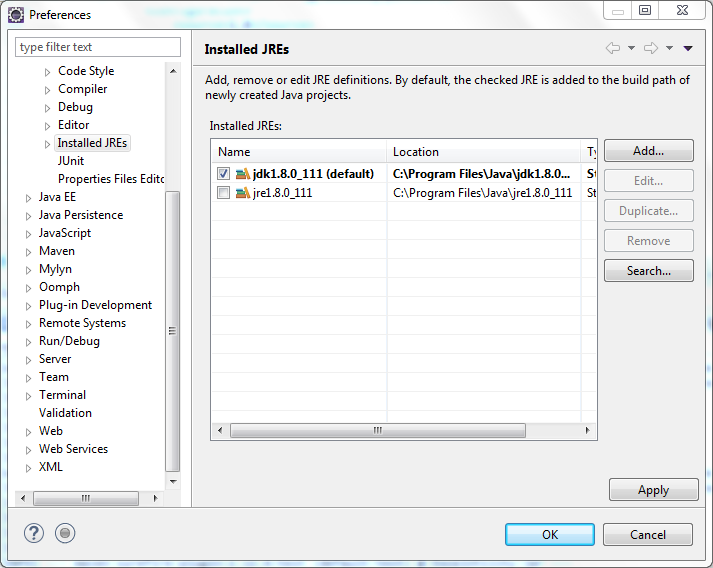 When you install a JDK, the installer asks you where you want to install the files. By default, on Windows, this is something like C:\Program Files\Java\jdk1.8.0_74 (or whatever version you are installing). It then asks you for a directory to install the JRE to, which by default is something like C:\Program Files\Java\jre1.8.0_74. I was rushing things, and thinking the installer was asking me the same question twice, set both my JDK and JRE install locations to D:\devtools\jdk\jdk1.8.0_74, resulting in the installer overwriting the JDK with the JRE. This resulted in (among other things) a missing javac.exe in my JDK bin, and the same error the OP reported here in all my maven builds. 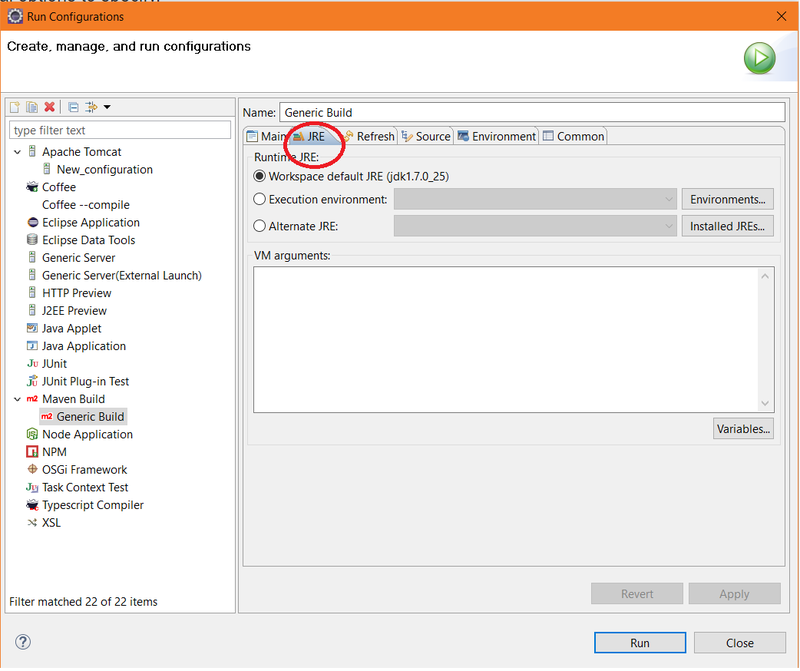 The most common solution for this problem is to change jdk location as my Installed JREs instead of the JRE location but that did not solve my problem this one time. So I did the below to solve the problem. 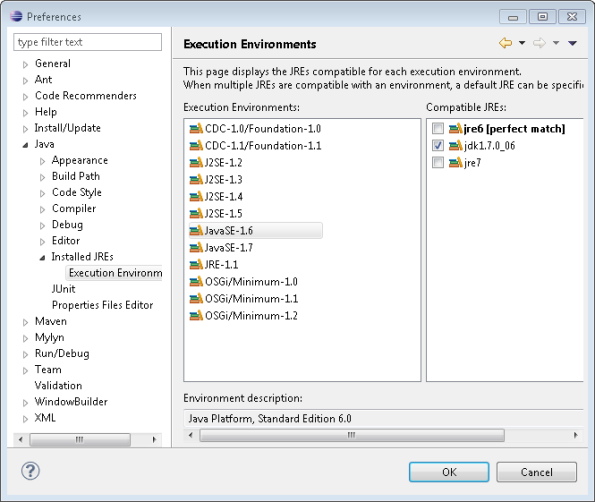 Expand the Installed JREs tab and you will find a Execution environments tab. Click on your favourite execution environment. In my case it was JAVASE-1.8. There it shows 2 options. JDK and JRE. Select JDK there and the problem is solved. My answer pertains to the Eclipse in Windows environment. Hoping this spares some poor wanderer of some trouble. In my case I had system variable path has "C:\ProgramData\Oracle\Java\javapath" location. In "C:\ProgramData\Oracle\Java\javapath" location java, javaw only there. So I am getting the same error. Once I removed all files in "C:\ProgramData\Oracle\Java\javapath" folder my error got resolved. I did the following change and it worked for me.Hope it helps someone. 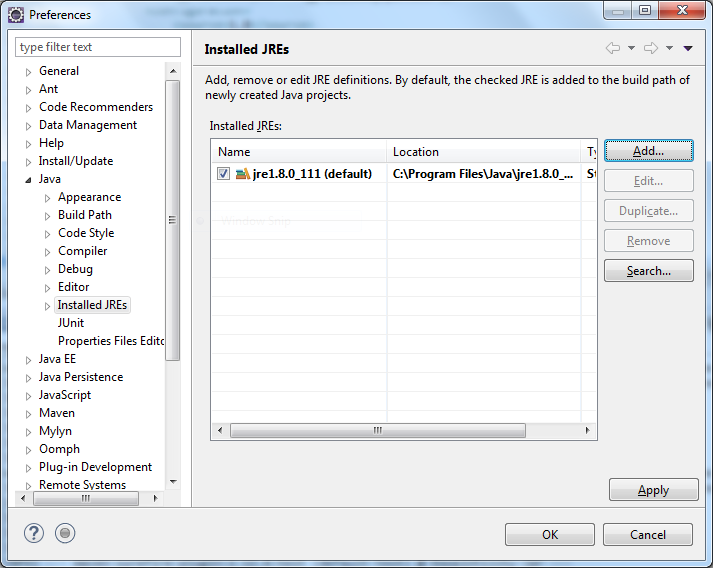 Add new JRE definition (select path JDK), worked for me. I was getting the same error when I created a new EC2 ubuntu 16.04 instance with Java already installed on it and while running mvn clean package, I encountered this issue and the below solution worked for me. In addition to answer above, I could say that just try to run Maven from the terminal (outside of Eclipse). 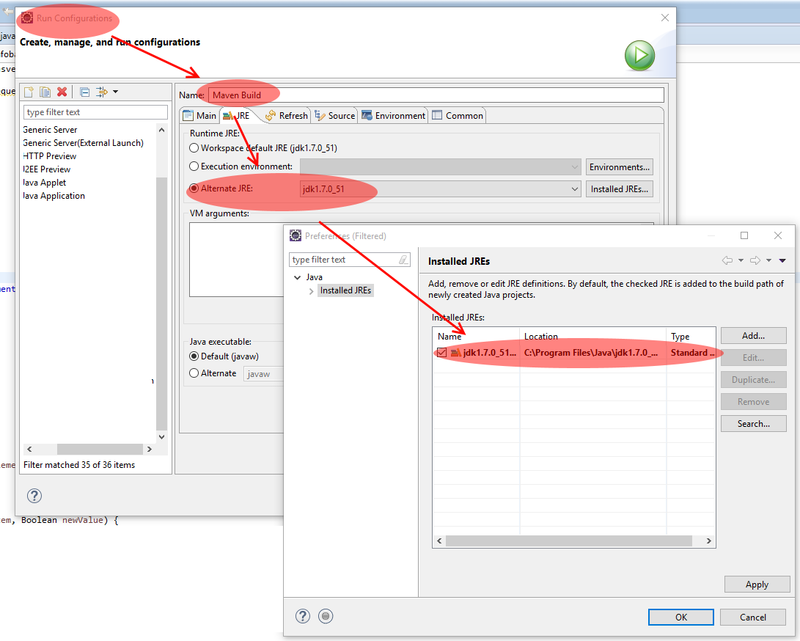 In this way, if it builds from outside but not in Eclipse, you can understand that the problem should be in Eclipse. There are several answers regarding this question but all are related to right path configuration of JDK, but with JRE only we can solve this problem. We just need to make use of deployment assembly to configure the path of packaged war file of the Java EE Project and then re-run the maven-install. This will build your project successfully, without any compiler error. Hope this solves the problem without JDK. Are you missing any maven build. Apart from above JRE changes.I still faced similar issue.I was missing JUnit dependency after adding it is working fine. 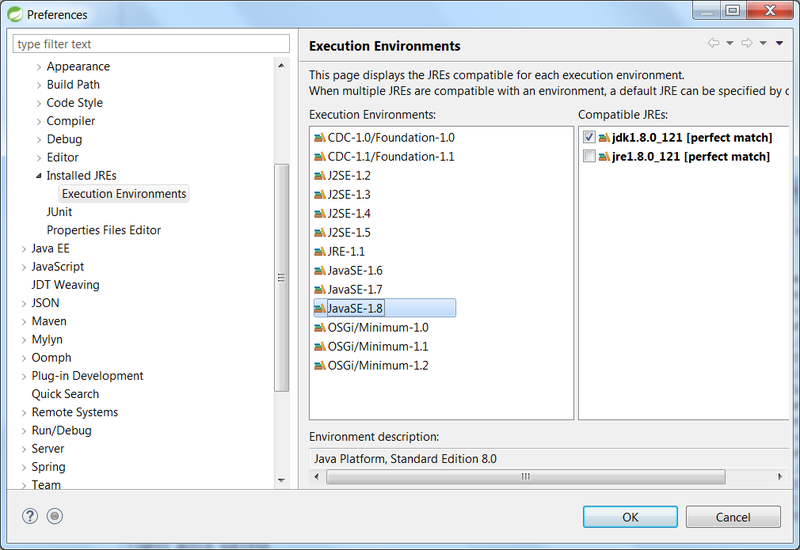 I went to Preferences --> Java --> Installed JREs I did NOT see the JDK in here. I only saw the JRE here. So I added the JDK. here we have to mandatory remove JRE instead of just unchecking. Not the answer you're looking for? Browse other questions tagged java eclipse maven java-7 m2eclipse or ask your own question. Android Studio: No compiler is provided in this environment. Perhaps you are running on a JRE rather than a JDK? Failed to execute goal org.apache.maven.plugins:maven-compiler-plugin:3.5.1 Perhaps you are running on a JRE rather than a JDK? mvn compile - [ERROR] No compiler is provided in this environment. Perhaps you are running on a JRE rather than a JDK?